Something that could be considered new for Honda, because now they're setting up the unit to play in the 3-wheeled vehicle segment. 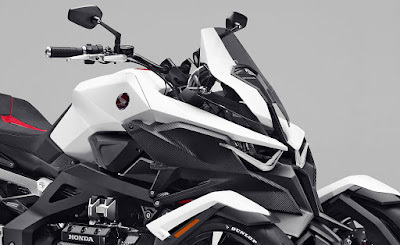 It is planned to be issued by Honda with a product named 'Neowing' and called as Light Weight Super Sports Concept. Just as a tricycle in general, Honda Neowing has two wheels in front and one behind. 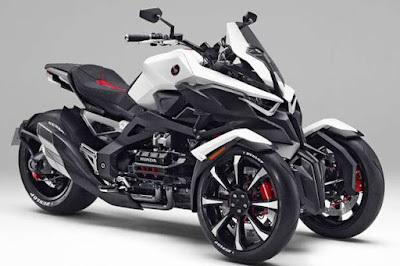 According to Honda, despite the three-wheeled but cornering ability and sensations that are served by Neowing the same as a two-wheeled motorcycle. This means that the construction of the suspension used is indeed made for comfort. The Honda Neowing specialty is the use of hybrid system which is combining 4-cylinder gasoline engine with electric motors to generate torque force. The trip will be more enjoyable because with the windshield.